Mozilla’s bleach library is a security-related library. The design goals of Bleach is to sanitize input of malicious content. Furthermore it let software developer safely create links. IPython is a command shell for interactive computing in multiple programming languages, originally developed for the Python programming language, that offers introspection, rich media, shell syntax, tab completion, and history. Given a fragment of HTML, Bleach will parse it according to the HTML5 parsing algorithm and sanitize any disallowed tags or attributes. 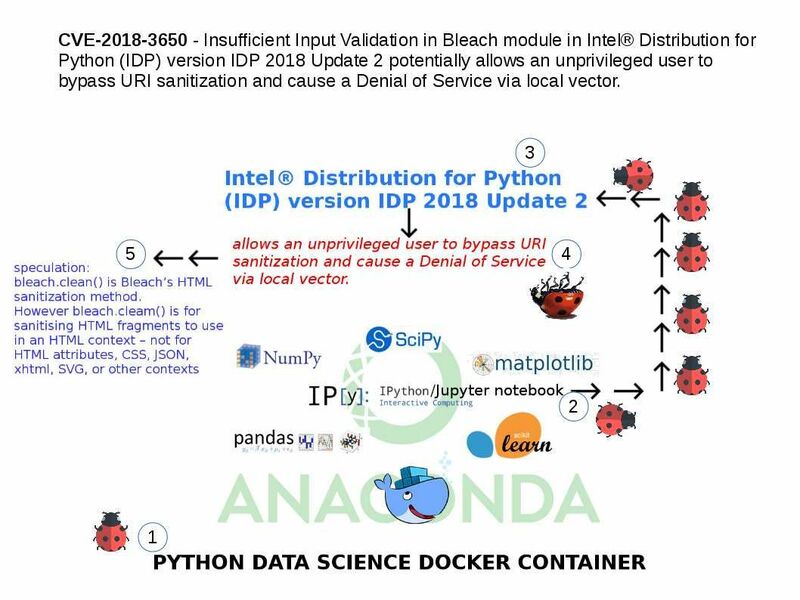 Synopsis – Insufficient Input Validation in Bleach module in Intel® Distribution for Python (IDP) version IDP 2018 Update 2 potentially allows an unprivileged user to bypass URI sanitization and cause a Denial of Service via local vector. Any interest? Perhaps you have this domain knowledge. Should you have interest, please refer below hyperlink. Previous PostAug 2018 – Do not contempt this vulnerability (CVE-2018-5390)Next PostAug 2018 – Less than one month, VMware out-of-bounds read vulnerability happen again!